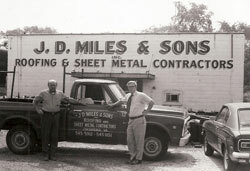 The founder and owner J. D. Miles established J. D. Miles & Sons in what was then Norfolk County as a roofing firm in 1910. The small roofing company grew over the years with several of the Miles children growing into the business. Joe Miles, Jr. and Claude Miles, both sons of the founder, purchased the business from the estate of J. D. Miles, Sr. upon his untimely death in 1948. While the current office and warehouse are located at 210 “B” Street in Chesapeake, the business has moved three times within the last fifty years but always into a larger location and always within a three mile radius. J. D. Miles & Sons incorporated in 1957 and specializes in government, commercial and residential roofing and reroofing. The company’s current business mix is approximately 30% built up and modified roofing, 20% steep (slate, tile, shingles), 20% metal, and 30% single-ply (primarily EPDM). Joe Miles, Jr. retired from his position as Chairman of the Board of J. D. Miles & Sons, Inc. in 1993. He had held the position of President of J. D. Miles & Sons, Inc. from 1949 until 1986 when he became Chairman of the Board. He passed away in 1997 after passing the corporate reigns to J. Dudley Miles, III. J.D. Miles & Sons, Inc. has completed work over the past several years at the Kingsmill Conference Center and City Library in Williamsburg, the Chrysler Museum in Norfolk, additions to hospitals including Sentara Norfolk General and Suffolk’s Obici, the UOPH at Wallops Island, and large reroofing projects for the Corps of Engineers at Fort Eustis and for the Navy at Cheatham Annex, Naval Air Station Norfolk, NOB, Oceana in Virginia Beach, and Norfolk Naval Shipyard in Portsmouth, VA. They have also recently completed roofing on several new shopping centers in Virginia Beach, Petersburg, Smithfield, Norfolk, Hampton, Richmond and Newport News. Several schools have been reroofed for the cities of Norfolk, Portsmouth, Chesapeake, Hampton, Yorktown, Williamsburg, Newport News and Virginia Beach. In South Hampton Roads those schools include Deep Creek High, Indian River High, Western Branch High, Cooke Elementary, Lynnhaven Elementary, Independence Middle School, Fairfield Elementary, Pembroke Elementary, Providence Elementary, Princess Anne High and Indian Lakes Elementary. J. Dudley Miles, III currently serves as Chairman of the Board of J. D. Miles & Sons, Inc. Dudley grew up in the roofing business, but pursued a teaching and coaching career for six years after graduating with a pre-med. degree from Hampden Sydney College in 1966. Dudley has served as President of Chesapeake Better Business Club, the Chesapeake Rotary Club, the Tidewater Chapter of the Construction Specifications Institute, and the Virginia Association of Roofing Contractors. He is Past President of the National Roofing Contractors Association, the oldest trade organization in the United States. NRCA represents over 4000 roofing contractors across the nation and has offices in Chicago and Washington, D.C. Over the past twenty years Dudley has presented papers and discussed current technology at over 100 roofing conferences and seminars with contractors, superintendents, owners, and architects in attendance both across the United States and abroad. He is a past chairman of the Board of Regents for the Roofing Industry Educational Institute, a Denver based corporation serving to educate all segments of the roofing industry. Dudley was bestowed with the J.A. Piper Award (the NRCA’s highest honor) in 1997. Virginia Association of Roofing Contractors inducted him into their Hall of Fame in 2004. J.D. Miles, IV joined the firm in 2001. J.D. was promoted to President in 2006. He serves as Estimator and Project Manager for our commercial roofing division as well as Manager of Information Services. He is the Past-President and sits on the board of the Great Bridge Rotary Club. J.D. is the current Pesident of the Virginia Association of Roofing Professionals and sits on the board of the Great Bridge Hickory Family YMCA and the Greater South Norfolk Business Consortium. J.D. is a graduate of the 2005 class of the National Roofing Contractors Association’s Future Executives Institute. He is also a graduate of the 2006 class of Ignite Chesapeake. J.D. was formerly Senior MIS Consultant at Vanderbilt University in Nashville, TN for 7 years. He graduated from Vanderbilt University. Sherri Miles-Foley, Vice-President, represents the fourth generation of Miles leadership. Sherri took her college degree from Georgetown University and worked with a law firm in Northern Virginia for two years prior to entering the roofing business. After joining J. D. Miles & Sons, Inc. in 1994, Sherri worked for Georgia’s “Family Business of the Year”, L. E. Schwartz & Son, Inc. of Macon for several months, prior to returning to her current position. Sherri served as Treasurer for the Tidewater Chapter of the National Association of Women in Construction (NAWIC) in 2000-2001. She is on the Board of Directors for D’Art Center in Norfolk. She also served on the Roofing Quality Management Committee and Board of Directors of the National Roofing Contractors Association. She is a past President of the Virginia Association of Roofing Contractors. Sherri was named as the outstanding Virginia Roofing Contractor of the Year in 1999. Other key personnel at J. D. Miles & Sons, Inc. include Tim Allen who has been a roofing and sheet metal supervisor for over 16 years. Tim supervised the completion of reroofing a 4500 square warehouse at Cheatham Annex (value approaching 1.5 million dollars). Javier Diaz is a low-sloped roofing foreman with 10 years experience and is one of the most requested foremen in the area by general contractors. Ray Coykendall is one of our Project Managers with over 15 years experience. 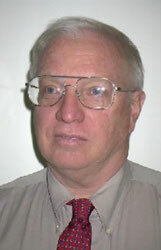 Ray Coykendall also serves as one of the Commercial Estimators and oversees the sheet metal division. Robert Hughes is our general superintendent and serves as director of plant operations. Robert attended National Roofing Contractors Association Quality Management training at the University of Chicago. Dan Beiler was hired in 1988 as safety director and has completed several safety-training sessions with Liberty Mutual Insurance as well as college courses dealing with various aspects of safety. Dan currently maintains membership in the American Society of Safety Engineers and National Safety Council. Dan has been responsible for J. D. Miles & Sons emphasis on safety. The company’s .66 experience modification rate is testament to Miles’ continuing commitment to getting the job done safely over many years. J. D. Miles & Sons, Inc. is an equal opportunity employer and has had an active, ongoing drug-testing program in place since 1989. J.D. Miles & Sons, Inc. has the distinction of being named a Firestone MASTER CONTRACTOR since 1996. In addition, for the last two years the company has been awarded the Inner Circle of Quality award. They are also a GAF MASTER CONTRACTOR for commercial roofing and a GAF MASTER ELITE CONTRACTOR for shingle roofing. JohnsManville and Tremco site Miles as a Certified Elite Contractor. J.D. Miles & Sons, Inc. was recently honored with the prestigious MARO award from Gilbane Construction for exceeding the schedule and quality work on the Gateway Computer project in Hampton, VA.